The typical banking IT attack surface has greatly expanded over the past several years. Thanks to more capable mobile devices, social networks, cloud computing, and unofficial or shadow IT operations, authentication now has to be portable, persistent, and flexible enough to handle these new kinds of situations. Banks have also realized that they aren’t just defending themselves against external threats, that authentication challenges have become more complex as IoT has expanded the potential sources of attacks. That is why banks have moved towards adopting more adaptive authentication methods, using a combination of multi-factor authentication (MFA), passive biometric and other continuous monitoring efforts that can more accurately find fraudulent use. It used to be that adaptive authentication forced a trade-off between usability and security, but that is no longer the case. Nowadays, adaptive authentication can improve overall customer experience and help compliance regulations as well as simplifying a patchwork of numerous legacy banking technologies. 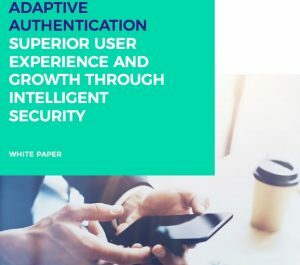 In this white paper I wrote for VASCO (now OneSpan), I describe the current state of authentication and its evolution of adaptive processes. I also talk about the migration from a simple binary login/logout situation to more nuanced states that can be deployed by banks, and why MFA needs to be better integrated into a bank’s functional processes. This entry was posted in security, white papers by dstrom. Bookmark the permalink.